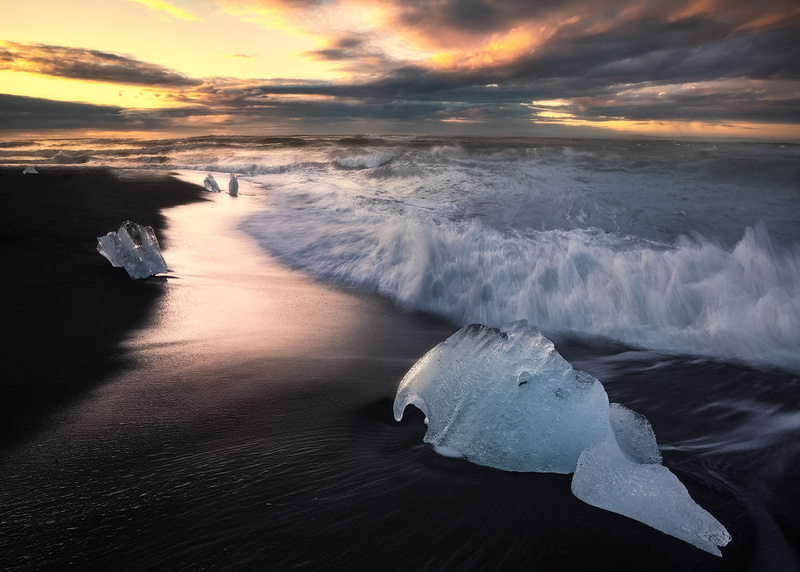 Sunrise behind Icebergs on Iceland’s black sand beach Breidamerkursandur. Incorporating transition into an image can make it more dynamic. There are different types of transition that you can use, but one that works well is to have warm tones (such as orange and yellow) transitioning to cool tones (such as blue). The above image of Iceland’s glacier beach has a decent sunrise in the distance that creates warm tones in the upper part of the image. These warm tones give us half of what we need to create a warm to cool transition. However, the sand in the foreground is black, not blue. So, in order to incorporate a warm to cool transition, I pushed some blue into the shadows. So, how did I do this in Photoshop? 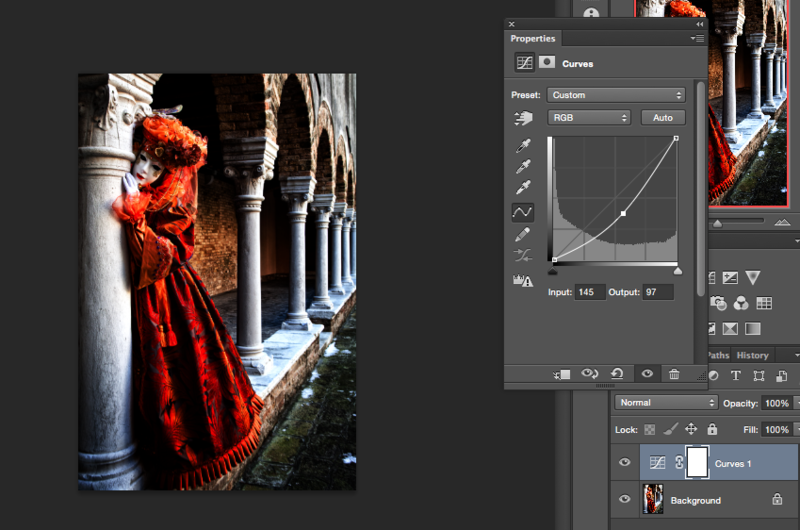 If you have a little experience using Curves layers, it is quite an easy adjustment to make. First, add a Curves adjustment layer. Then, click on the layer so that the curve becomes visible and change the RGB pull-down box to “Blue”. The blue tone curve is now showing, as seen in the next image. Next, click on the curve around 1/4 to 1/3 from the bottom to place an anchor point. The idea here is to limit the adjustment to the darks. Lastly, click on the bottom-leftmost point on the curve to select it. Click the up arrow on your key- board perhaps 5-7 times. You will notice blue moving into your shadows as the anchor point moves upward. The blue will be subtle. For some images, this can improve the transitional qualities slightly. Posted in Processing Tips on April 7, 2017 by Ken Koskela. 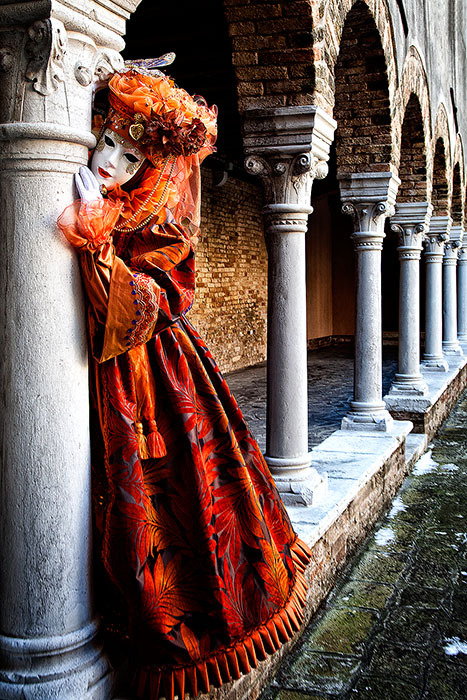 Photographers use vignettes to put a subtle frame around (and draw attention to) the subject of the picture. They draw our eyes to one part of an image and away from the remainder of the image. For me, creating an effective vignette is a balance between getting the effect of the vignette, but still not noticeable to the untrained eye. So, what is a vignette? For the definitive answer, let’s look at the ultimate source of all things true… Wikipedia. According to Wikipedia, a vignette in photography is “a reduction of an image’s brightness or saturation at the periphery compared to the image center.” Couldn’t have said it better myself. Although you can also vignette with a blur. But they got it mostly right. Anyway, in most cases, vignettes are based on a reduction in brightness, which is what we’ll be discussing here. Below is a picture of a cheetah with no vignette. You will notice the image looks fairly evenly lit throughout. Below I have added a subtle vignette to the image. Notice the cheetah’s face is a little brighter as compared to the rest of the image. It is somewhat difficult to see, but it does help focus your attention on the cheetah. 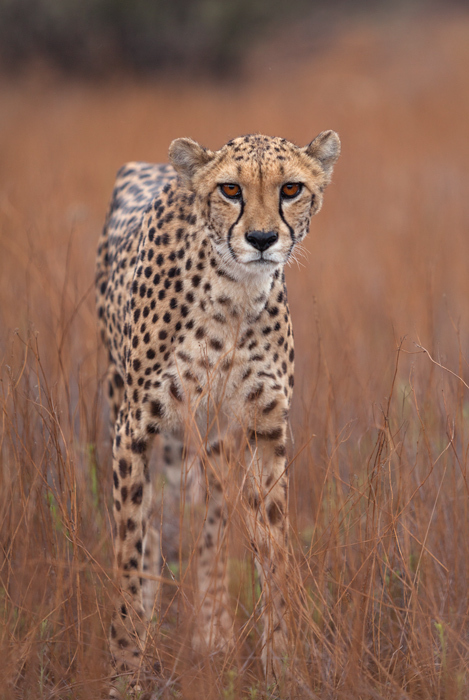 And cheetah’s command attention. Just in case you can’t see the vignette, below is a version in which I apply too much vignette so the effect is clear. Make sure your foreground and background colors are set to black and white, as shown in the image below. 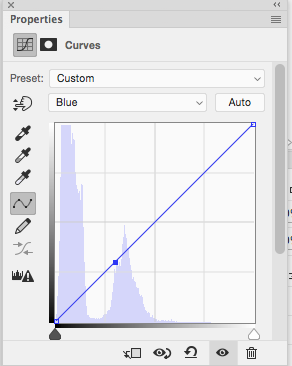 Create a curves adjustment layer which will result in a layer mask that looks like the one below. Do Command-Shift-I (Mac) or Control-Shift-I (Windows) which will change the mask colors (black & white) to the inverse. 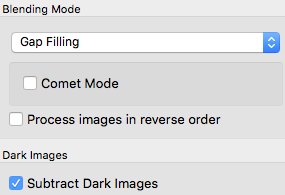 Select “refine mask” in the menu (Command-Alt-R for Mac or Control-Alt-R for Windows) and, if you are working with a RAW or large JPG, try an initial feather at around 250. The idea is to get a nice feather around the edges of the image. Change the blending mode to Multiply, which will darken the selected area. You image should look like this, which looks pretty horrible. Lastly, reduce the opacity until the vignette is not really noticeable. I usually reduce to around 20%, as in the case here. You can make further refinements to the vignette with a brush. I sometimes do this if a corner is already dark and the vignette results in the corner being too dark. Just paint black on the mask at perhaps 30% opacity until the effect is painted out. Posted in Processing Tips on November 19, 2015 November 19, 2015 by Ken Koskela. 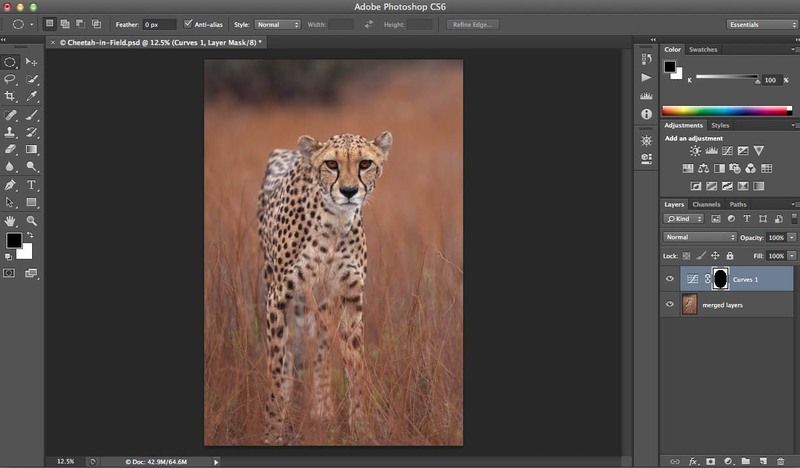 For many photographers, the last step in the image processing workflow is the creation of a downsized JPG from a large Photoshop file. During this downsizing process, you lose some sharpness in your image. 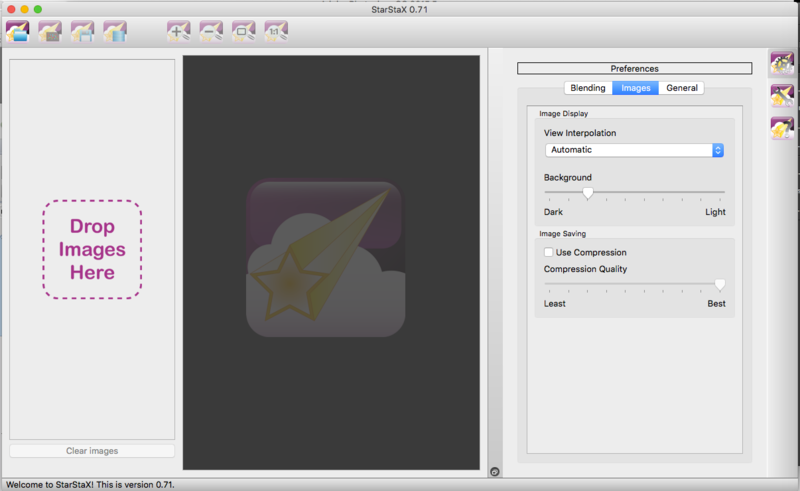 Because of this, it is important to add back some “output sharpening” while creating the JPG. 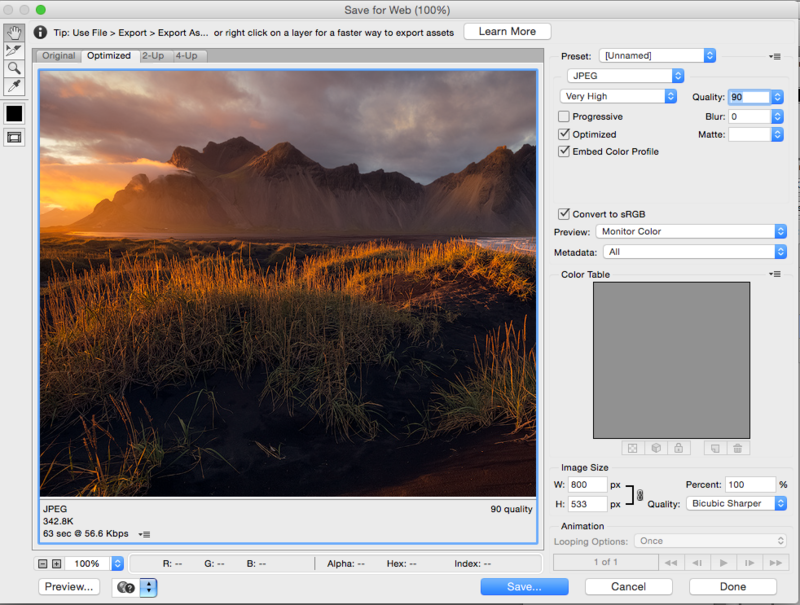 There are a range of options for doing this, including sharpening during export in Lightroom, sharpening a layer in Photoshop or using a Photoshop plug-in, such as Nik’s Sharpener Pro. 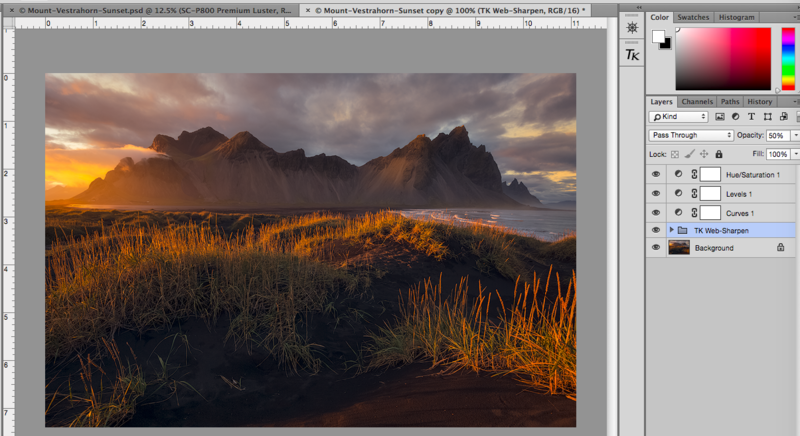 I tried a number of methods and landed on a Photoshop action created by Tony Kuyper. The “Web-Sharpening” tool is built into Tony’s “TK Actions” panel. This set of actions is the best value out there. 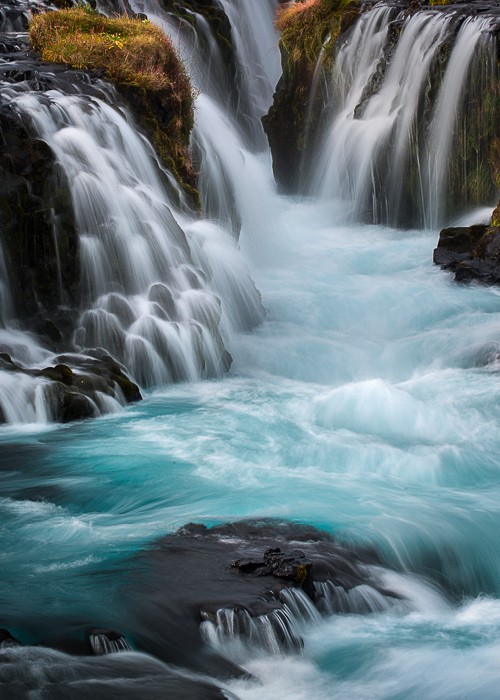 In fact, almost all of the landscape photographers I know use TK Actions. But, this blog is about the Web-Sharpening tool, so I will [try to] stay focused on that. I sharpened the image below using the action and, as you can see, the sharpening looks great (click on the image to see it as it appears on my site). I’ll take you through the process so that you can see how easy it is. 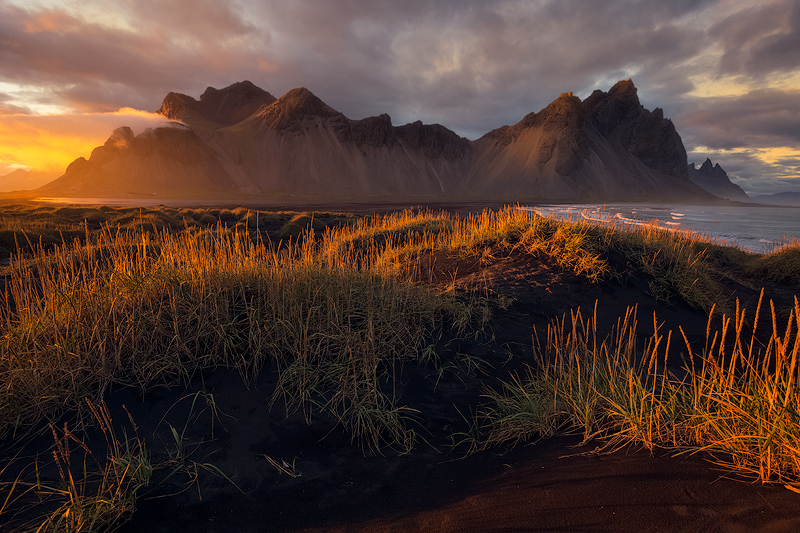 Glowing fields from low-angled sidelight in front of Iceland’s Vestrahorn Mountain. Below is a screen shot of the Web-Sharpening section of Tony’s actions panel. To size this image at 800 pixels wide for my website, I simply enter “800” pixels in the box, check “horizontal” for a horizontal image, leave the layer opacity at 50% (this can be adjusted later) and hit “OK”. If I understand correctly, the action first creates an image sized at 1.67 times your final specified image size. This image is over-sharpened and then re-sized to your originally specified size (in my case, 800 pixels wide). The action creates a separate file with a layer stack, as pictured below. Your Photoshop file is left unaltered. Below is a close-up of the layers. 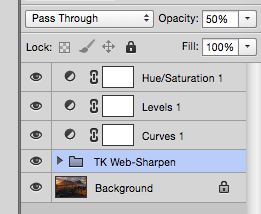 The sharpened image layers are grouped together in the layer called “TK Web-Sharpen”. 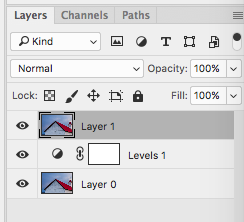 You’ll notice that the 50% opacity that I had specified appears as the opacity in the sharpened group layer. 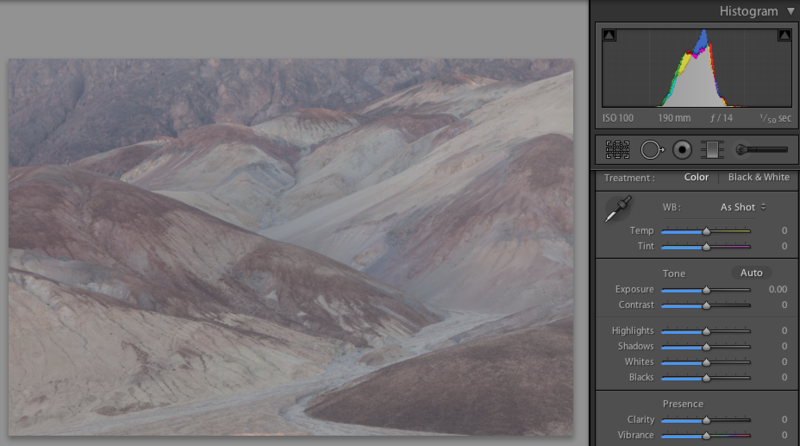 I find that 50% opacity works well on the sharpening group layer for most of my landscape images. 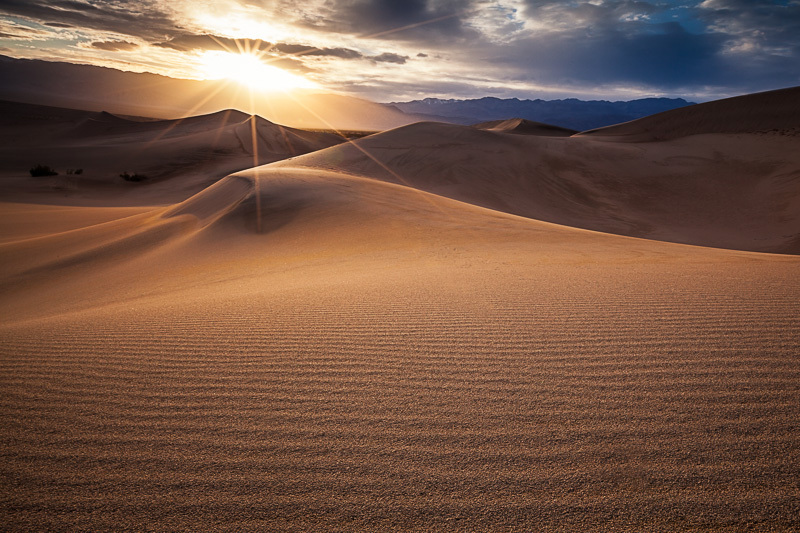 For landscape images that have a clear horizon line (such as in this example), I then add a white mask to the sharpening group layer and paint a black line on the mask along the horizon line at between 80-100% opacity. 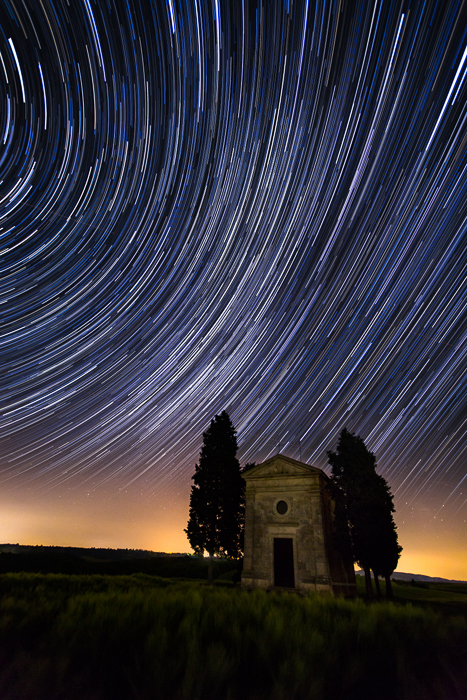 This is because sharpening a high-contrast horizon line can often make a slight halo look more pronounced. Masking it out solves this potential problem. 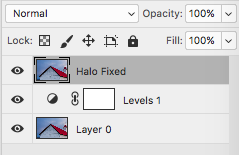 You then have the option of making additional adjustments using the available hue/saturation, curves or levels layers/masks. 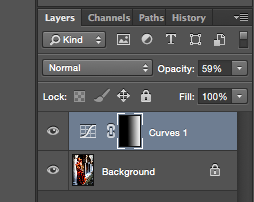 I normally use the Curves layer to increase contrast slightly to try to match the contrast of the Photoshop file. These three layers are available to further tweak the color or contrast of your JPG if you noticed a loss of either from your Photoshop file. 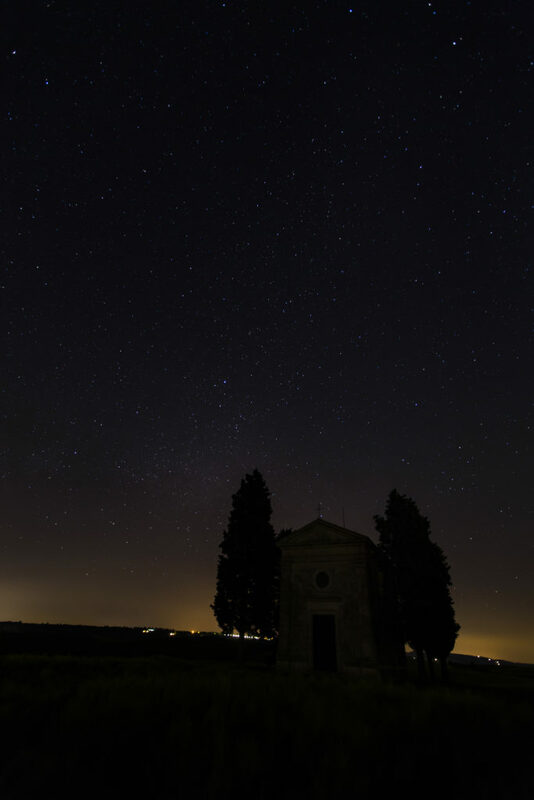 The image below was shot several hours after the image above. Because it was very dark, I shot this at high ISO. I was concerned about sharpening the noise which would make the JPG image appear noisier. 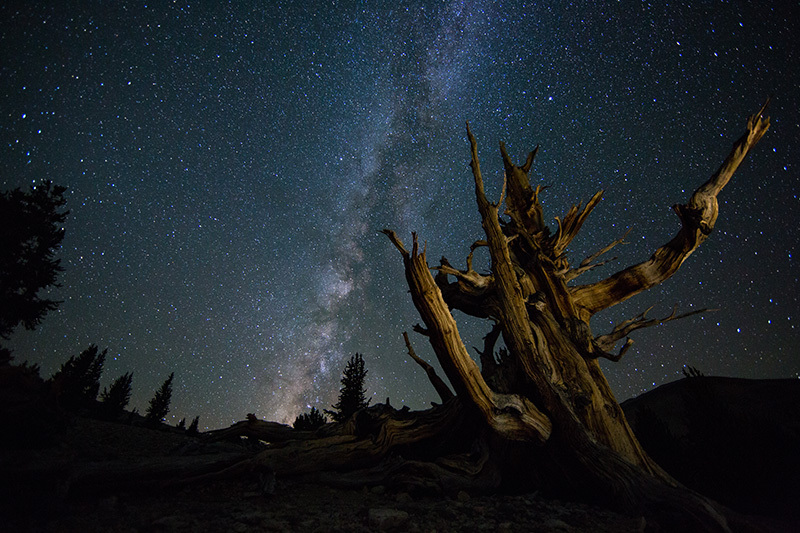 So, for this image, I masked out almost all of the sky in addition to the horizon line. I also use the Web-Sharpening action for my portrait work. Because I want to avoid over-sharpening my already-heavily-sharpened subjects, I drop the opacity to 30% which seems to be the right amount to me. You can find the TK Actions panel at the link below, as well as excellent videos by Sean Bagshaw on how to use the actions, including the Web-Sharpening tool. Even though the Web-Sharpening tool alone is worth the price, you get loads of actions as part of the TK Actions panel, including the famous luminosity masking actions which will change your life. 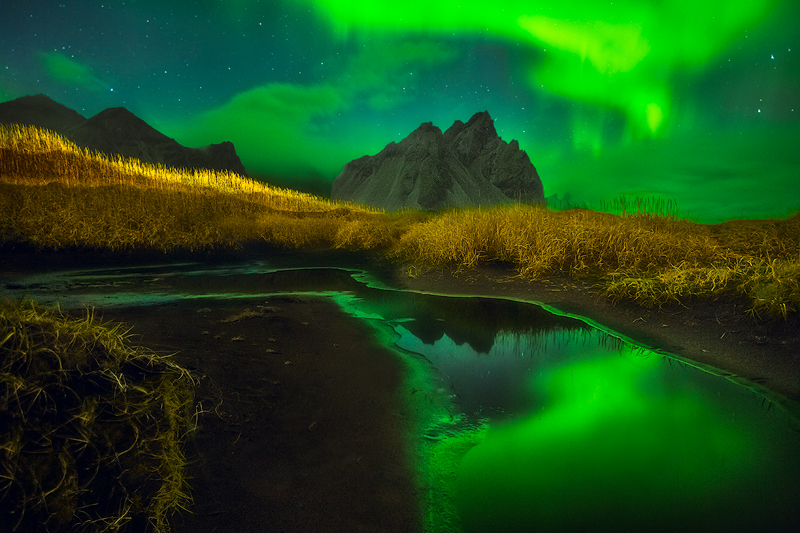 Posted in Processing Tips on November 1, 2015 November 2, 2015 by Ken Koskela. 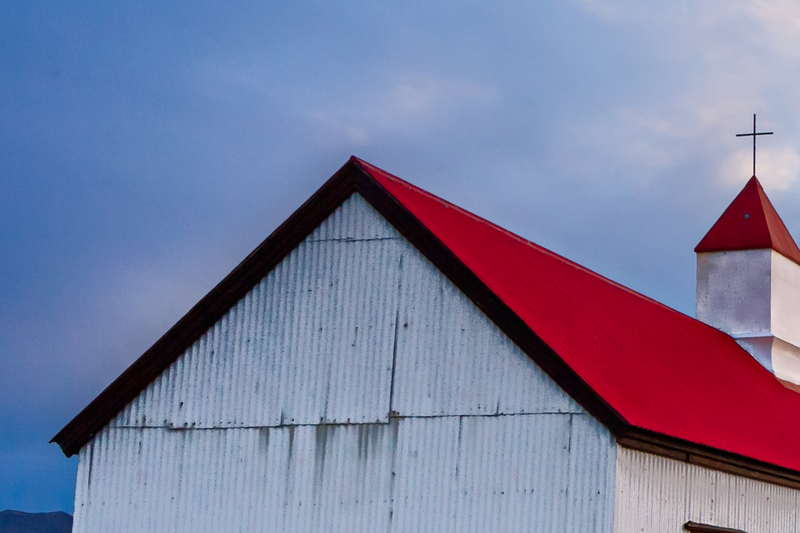 I frequently use the gradient tool in Lightroom and Photoshop to draw attention to the subject of my photograph. Gradients are extremely useful because they can help create gradual transitions between adjusted and non-adjusted areas. This blog won’t be a comprehensive look at gradients, but simply a demonstration of how I use them for one particular purpose. 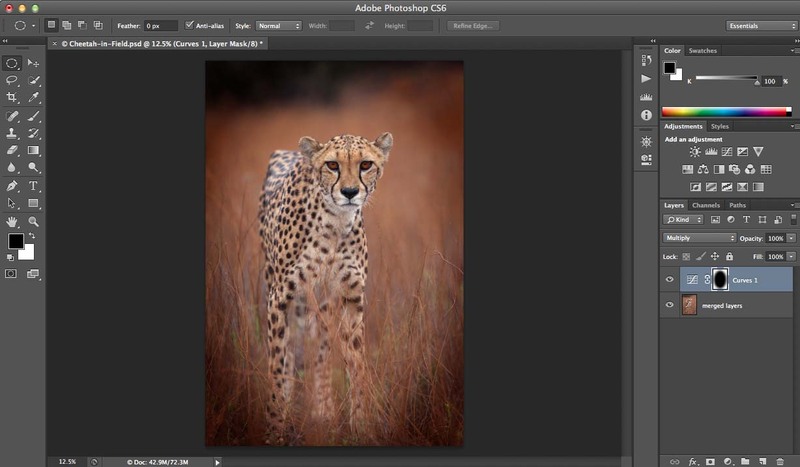 This blog assumes that you have a basic knowledge of either Lightroom or Photoshop. With those disclaimers, let’s get started with a quick description of what a gradient is. For our purposes, a gradient is the gradual feathering of whatever adjustment is being made to the image. There are different types of gradients, but the one I use is the most straightforward. At the start of the gradient, 100% of the adjustment is applied, while at the end 0% is applied. There is an even feathering of the adjustment between start and end. This will be better illustrated using an example. Here are before and after pictures to show you how I use a gradient to draw attention to my subject by darkening the outer areas of the image. 1. First click on the gradient tool (pictured below). This will bring up the local adjustment menu. 2. 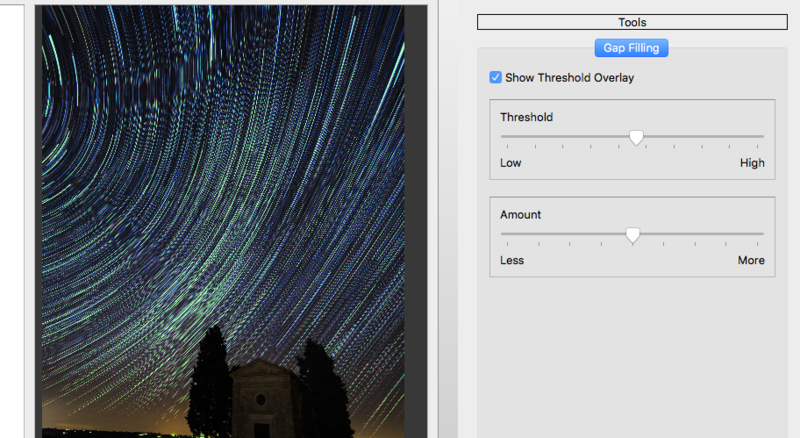 Adjust the exposure slider left, as in the image below. 3. 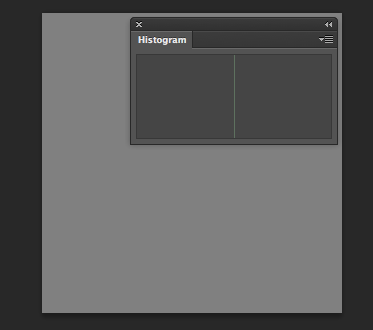 Then drag the gradient from somewhere outside the image towards the subject. I usually overlap the gradient with the subject because the effect is hardly applied as you get to the center. 4. Fine-tune the adjustment using the exposure slider. Generally, you don’t want to go too obvious with the adjustment. 5. Hit “New” at the top of the menu and then repeat the adjustment from other sides and angles if you want. In this case, I’ve used three gradients, including from the right side, left side (but angled upward) and top left corner. 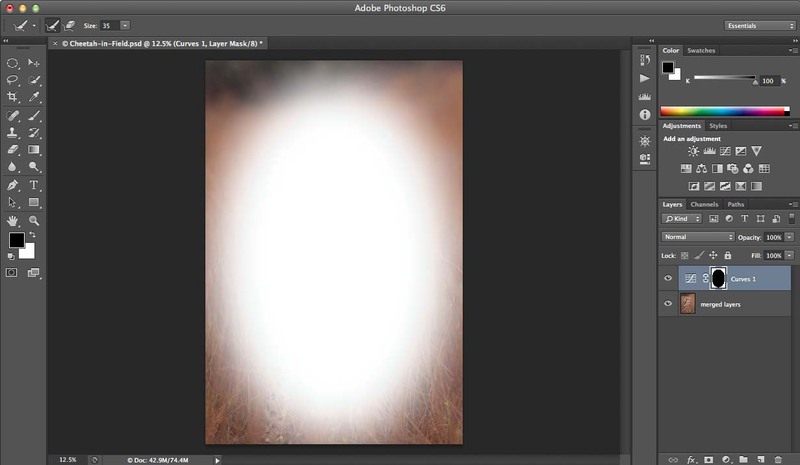 For Photoshop, below is one way among many to get the same basic effect. 1. 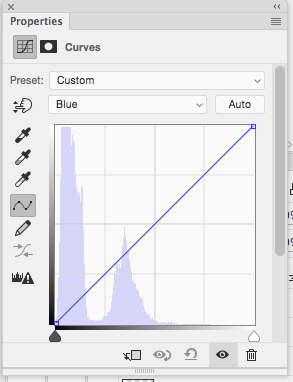 Create a curves adjustment layer. 2. Click on the middle of the curve and drag the curve down to darken the whole image. 4. Make sure your foreground color is set to white and your background color is set to black, as in the picture below. Hitting the letter “d” on the keyboard should re-set the foreground/background colors to these default settings. 5. 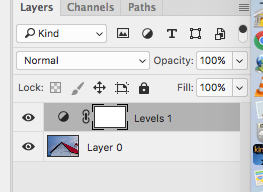 Then, make sure the layer mask is active by clicking on it and drag the cursor from outside the image towards the subject. This will result in a feathered mask. 6. Adjust the opacity of the curves layer until you get the desired effect. You might ask whether you can accomplish the same thing by creating a vignette. With a vignette, you have less control because it is a single adjustment rather than several adjustments from multiple sides, each controlled independently. Lastly, you can use the same gradient techniques with a variety of adjustments, like contrast, saturation and a color fill layer, among others. 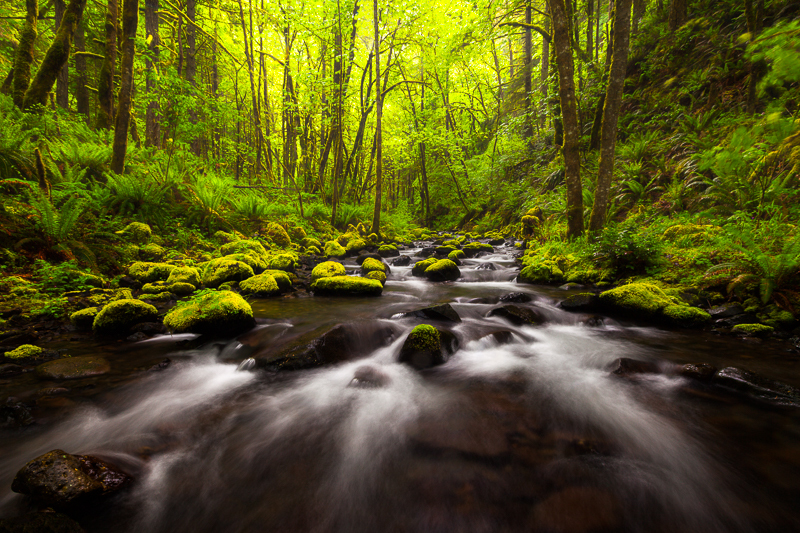 Posted in Processing Tips on August 26, 2015 by Ken Koskela. Okay, I admit it. The title to this blog sounds pretty boring. However, this is pretty important stuff. 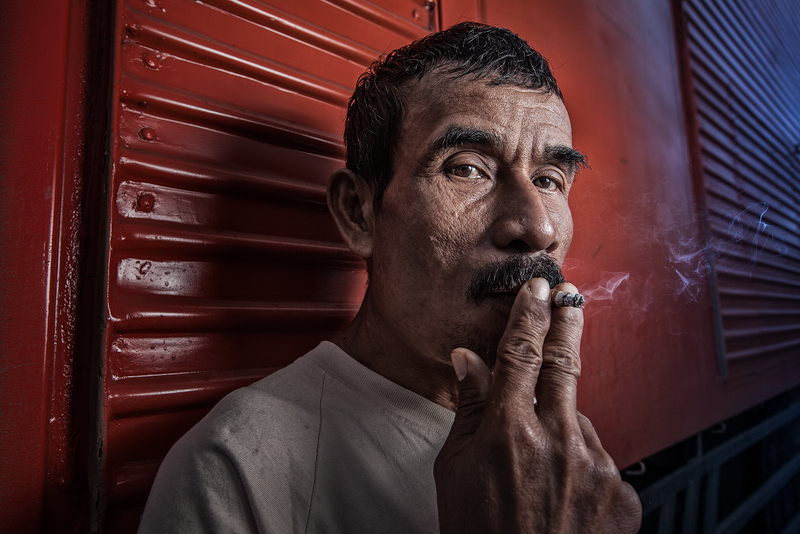 Apart from getting a compelling composition in camera, controlling tonal contrast during post-processing is perhaps the most important part of creating a successful image. So, read on! 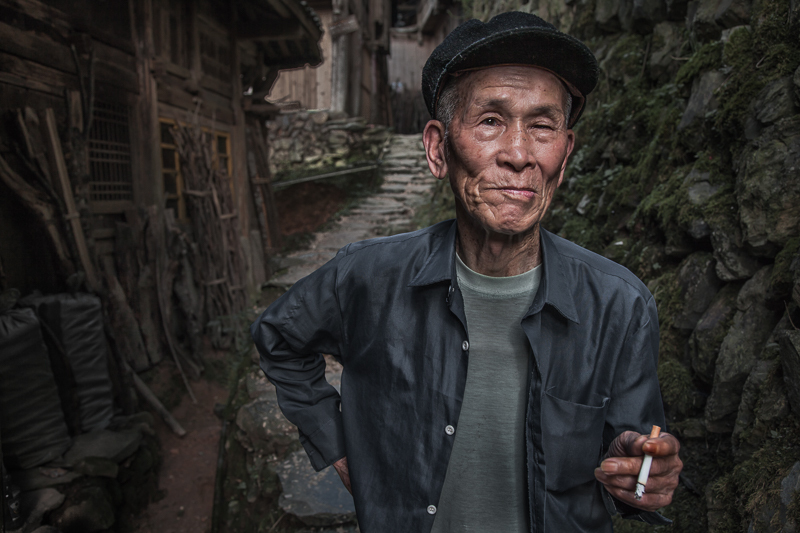 First, what does tonal contrast mean from a photography perspective? It is simply the magnitude of the difference between the light and dark areas of the image. 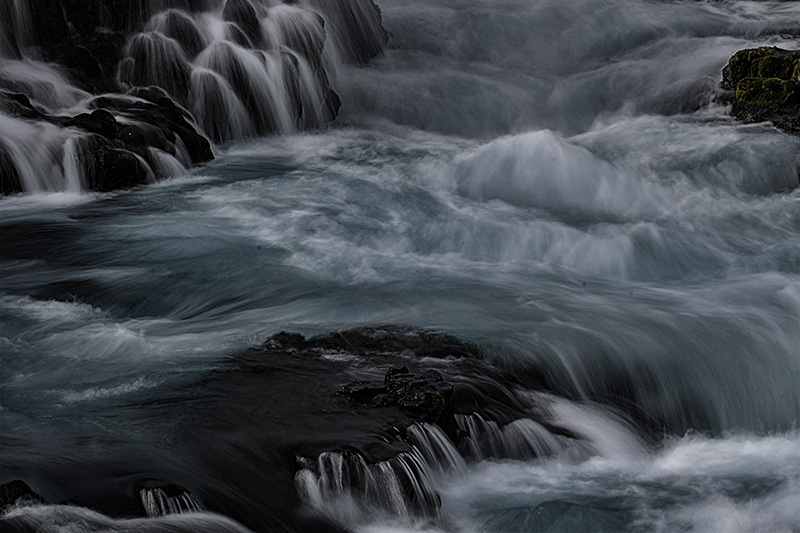 To see this visually, let’s look at the histogram… a tool found in your post-processing software that can help you control contrast more effectively. 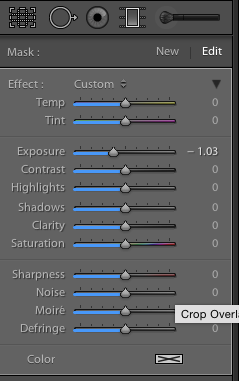 In Adobe Lightroom, you can make the histogram visible by making sure the word Histogram is checked under the Window menu. 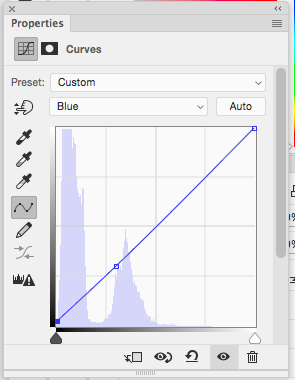 Whatever software you use, it should have the option to view a histogram. The image below is just a gray box. Every pixel is filled with the same tone… middle gray, which is exactly halfway between pure black and pure white. 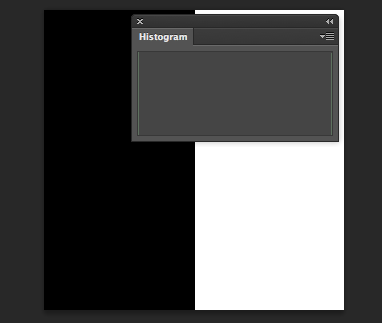 This zero contrast image results in a histogram that is made up of a single column right in the middle. Now, look at the next image. As expected, the histogram has two columns at the edges… the left representing the black pixels and the right representing the white pixels. All of the pixels are concentrated in two tones. Lastly, here is an image with a gradient applied from pure black to pure white. 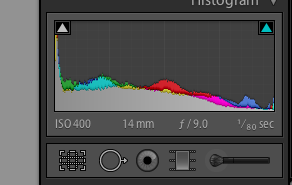 You can see what the histogram looks like in this case, with a full range of tones. 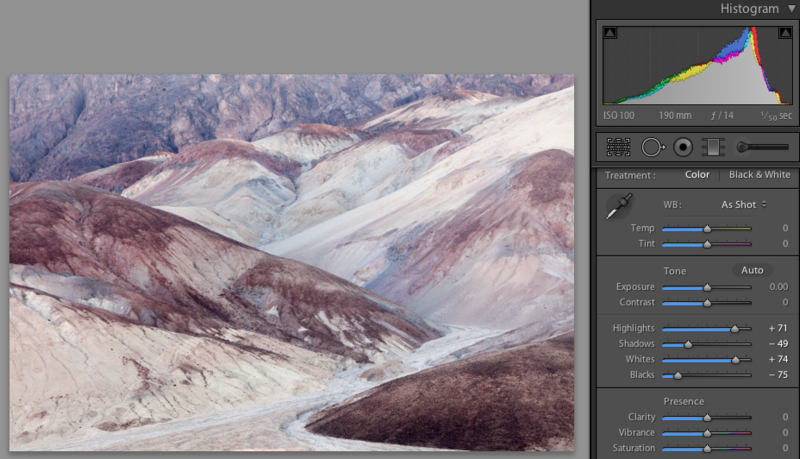 So, how do I actually control contrast and how do I use the histogram when processing an image? Although I work with contrast at different stages in post-processing, I initially adjust contrast as one of the first steps, right after white balance and exposure if needed. I will focus here on this initial contrast adjustment using a landscape image as an example. The image below is a pretty extreme example of one that completely lacks contrast and looks “gray” in tone. The histogram is concentrated around the middle. This image can be substantially improved by increasing contrast. Below is the same image after a quick contrast adjustment. This image is not finished with processing, but it certainly looks a lot better already. The histogram shows greater left to right movement. Each side of the graph does not quite reach the edge. I do this because I like to leave myself some room for a later contrast adjustment in Photoshop. First, looking at the histogram, I moved the Blacks slider to the left to get the leftmost part of the graph line fairly close to the edge, but not touching. So, there is no pure black in this image. If this image had pure black from the start, I may have moved the slider to the right to reduce the pure black in the image. Next, I looked at the darker parts of the image (ignoring the histogram) and adjusted the Shadows slider so that the image had greater contrast, but without losing detail in shadow areas. You usually want to still be able to see detail in at least some of the shadows. Third, looking at the histogram, I moved the whites slider to the right until the graph line was close to the edge, but had room to spare. If the image didn’t look good with that adjustment, I could have simply backed off on the adjustment. Also, if the graph was up against the right side at the beginning and I didn’t want pure white in the image, I would have moved it left to reduce or eliminate the pure white cells. Fourth, looking at the image, I adjusted the highlights slider until the image looked good and the lighter areas of the image showed some nice contrast. Fifth, I went back and tweaked the sliders again. It is important to note that this is really only an example of how I initially adjusted contrast for one particular image. 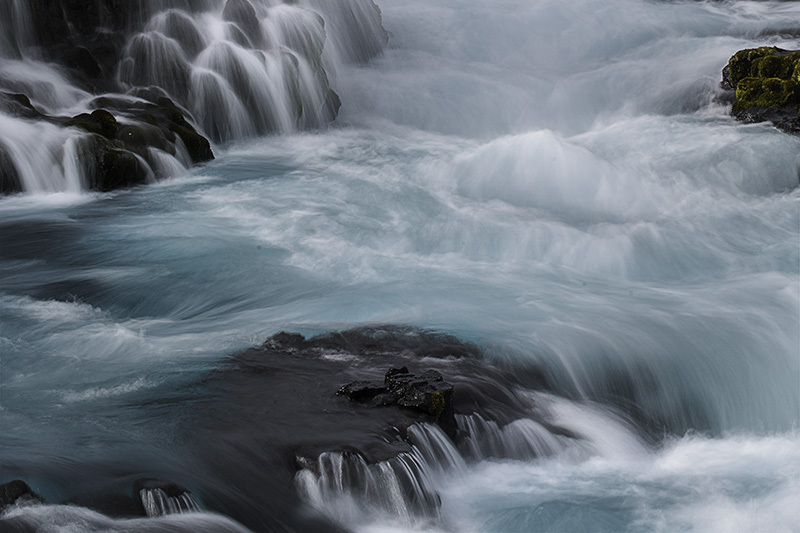 In many cases, you want to reduce contrast, rather than increase contrast. For some images, it is okay or desirable to have a fair amount of pure black and/or pure white in the image. 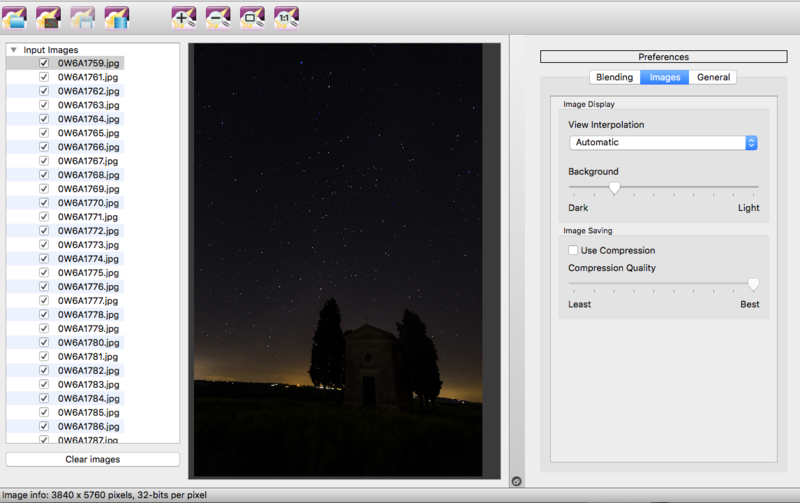 In some cases, you want your image histogram concentrated to the left, middle or right. An image of a night sky will likely have a histogram that shows a lot of dark tones and pure black. So, the above doesn’t apply in all cases. But, hopefully this exercise is helpful to you. 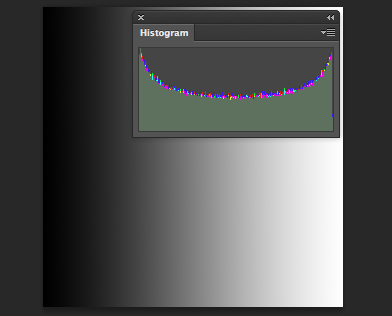 Most importantly, be sure to balance what you see in the histogram with what looks good to your eyes. Posted in Processing Tips on July 13, 2015 July 14, 2015 by Ken Koskela.